Completed in 2000, the Physical Education Building at Southern Utah University is both an educational and a recreational facility. The functions of the building are separated into individual components connected by the circulation space to reduce the impact of a massive 130,000 sq. ft. building. 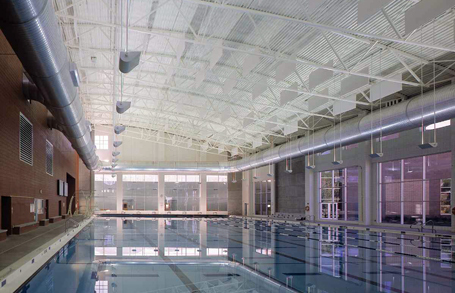 The building is comprised of two large volume spaces: a triple gymnasium with suspended running track, and a natatorium with a 50- meter indoor swimming pool with springboard diving and adjustable bulkhead. These two masses are oriented perpendicular to each other to give individual expression, with similar curved roof forms to maintain continuity. Counsilman-Hunsaker in association with FFKR Architects was retained by Southern Utah University to design the J.L. Sorenson Natatorium to enhance the programming space and needs for the students and community. The pool is used for various student programs such as swim lessons, kayaking, aerobic classes, lifeguard training, and fitness lap swimming.